Mind-blowing. If ever there's a book that puts its readers on a wild ride, then this is probably it. This one is finicky, restless, and something that would make you want to fasten your seatbelts. And the other interesting thing about this novel is that it reinterprets all of David Mitchell's other novels, putting them in a way larger universe than one previously imagined. See, The Bone Clocks is a fantasy novel, composed of 6 first-person narratives that centre around an English girl, Holly Sykes, from 1984 (when she was 15) to 2043. In this novel, there are regular human beings, also known as the Temporals, and the Atemporals, who are beings who are immortal (the Anchorites) or reincarnated (the Horologists). There is a war between the Anchorites and the Horologists, and somehow, Holly Sykes is in the middle of them all. I won't say anything else about the plot, as it is quite complex and I am afraid I am just going to ruin it. Let me talk about the structure instead. As with other David Mitchell books, it is composed of multiple narratives, employing multiple different styles. The term hyperlink cinema comes to mind. And for me, figuring out these connections and inter-relations is the fun part when reading David Mitchell. And I must say, this book brings inter-connected fiction to a new level. I mean, I thought that The Thousand Autumns of Jacob de Zoet was a historical novel. 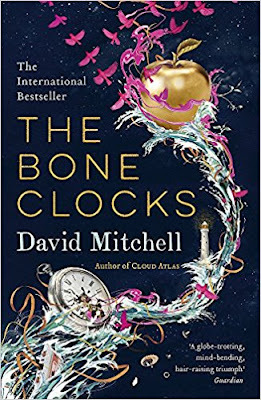 It is, if you read it independently, but after reading The Bone Clocks, you realise that the world portrayed in that book is actually a fantasy world, a single slice featuring 16th-century Asia in a universe of mortal and immortal beings. This is actually what I like about David Mitchell's books: every new book I read opens up another corner of his inter-connected universe, showing me areas that are previously closed and shut, and when it opens up, it's a totally different flavour. I must say I am impressed, and it shows how versatile Mitchell is as a writer. Speaking of flavours, each of the six different narratives that The Bone Clocks comprise of are written in different styles as well. This feature reminds me of Cloud Atlas. I suppose this feature makes every chapter seem fresh, and indeed, it kept me going. I just devoured it. I also like the themes that are discussed in this book, from the more obvious, such as immortality, life, and death; to the more obscure, like global warming, apocalypse, women's rights. It paints a bleak picture of the future, which is described in the final narrative, where Europe is a wasteland, and the United States of America is broken up into several pieces, and China is the world's superpower. It also goes into philosophical detail about people's attitudes to change. As much as it is a fantasy novel, it makes readers think about deeper issues as well. Overall I loved this book. It was a wild ride, and I absolutely recommend it to anyone wanting a fantastic read. It is fantasy, but the thing I like about it is that travel is not used as a plot-moving device. It's typically my complaint about typical fantasy novels, that the characters have to take a trip or something, through wild fantastic lands, but this book has none of that. It has a lot of other cool stuff instead. I give it 5 out of 5 stars.